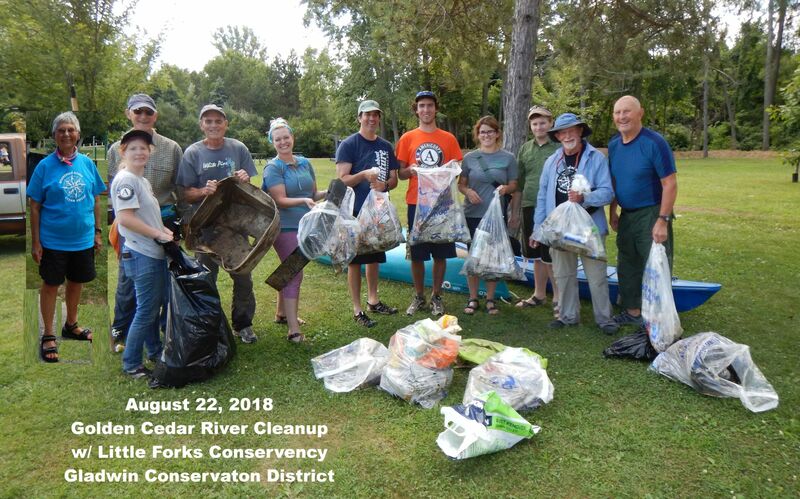 The Gladwin - Cedar River Cleanup went as expected. There was a good turnout of dedicated people and no one else. 2/17 of our volunteers or 12% failed to arrive. I expected 15% no shows. the success of the trip. No one got lost or tipped over. No one was injured or had any medical problems. We took a lot of trash out of the river. Maybe 150 to 200 pounds. The river was quite clean as compared to previous years. The river was low and that made it a little difficult at times but we persevered. I think we all had a great time and we all expressed a desire to continue this annual project as a community event. My thanks to Ted, Elan and Mike and all the volunteers for a fun and productive day. All the photos I took can be found here. Use them as you like. I will post this in an internal report on our website soon.